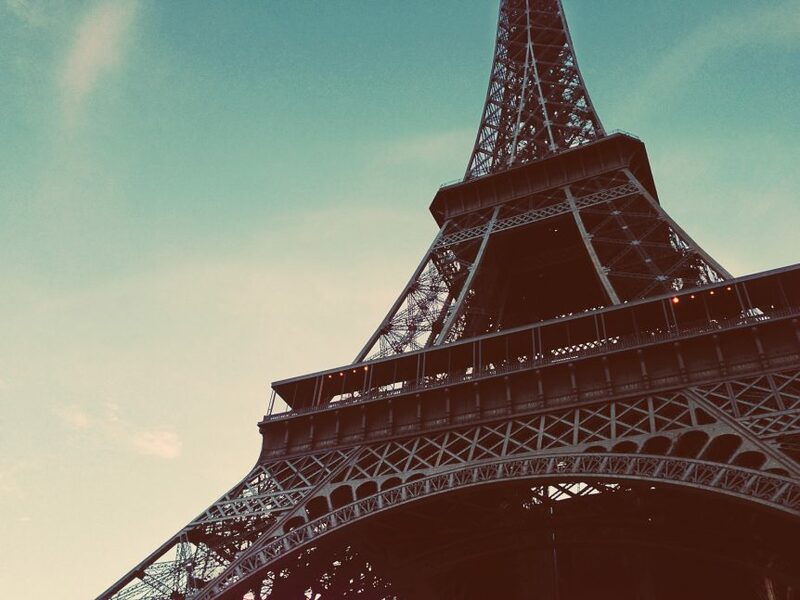 I recently had the pleasure of taking a long, much-needed vacation in Paris. While I was there, I couldn’t pass up exploring the many different locations around the city that sell fountain pens. I was surprised to find that fountain pens are found in many more places around Paris than just in specialty shops. Most department stores and stationery shops carry them as well! If you’re planning on visiting Paris and want to know about some of the shops I visited, which ones I’d recommend and if there are any items that you shouldn’t miss, this is the blog post you should read! As I mentioned, you’ll find fountain pens all over Paris, not just in pen shops. I was surprised to find them in all of the big department stores that I visited. Most smaller stationery stores carry fountain pens as well. You’ll also find more than just fountain pens. Fountain pen friendly paper and inks are widely available across the city. If you’re visiting Paris but don’t speak a lot of French, you don’t have anything to worry about. In all of the pen shops that I visited, I encountered people who spoke English and were happy to help out. Similarly, most employees at the department stores spoke English as well. The smaller stationery stores were hit-and-miss, but they typically had a small selection and I never had many questions to ask. One thing that you’ll notice is that you’ll find the same brands at most of the stores. In pen shops and department stores across the city, you’ll find writing instruments made by Montblanc, Waterman, Lamy, Parker, S.T. Dupont, Caran d’Ache, Cross and Graf von Faber-Castell. Most of the smaller stationery and office supply shops cary Lamy fountain pens and inks, but not many other brands. Of course, Clairefontaine papers and notebooks are abundant across shops in Paris. You can even find Clairefontaine notebooks in grocery stores! In the following descriptions, I’ll try to give a brief summary of what each shop carries and my general impression of each one. These lists of brands and products come from my memory, so there will definitely be some things that I miss. Things also change, so while a shop might have had something when I visited, there’s no guarantee they’ll have it when you visit. 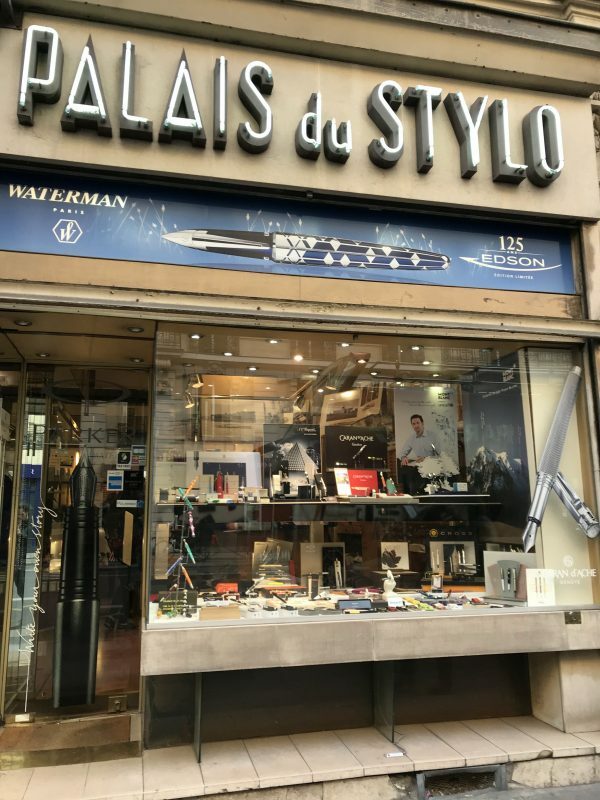 I also missed a few of the dedicated fountain pen shops that Paris has to offer, so there are definitely more than just these. 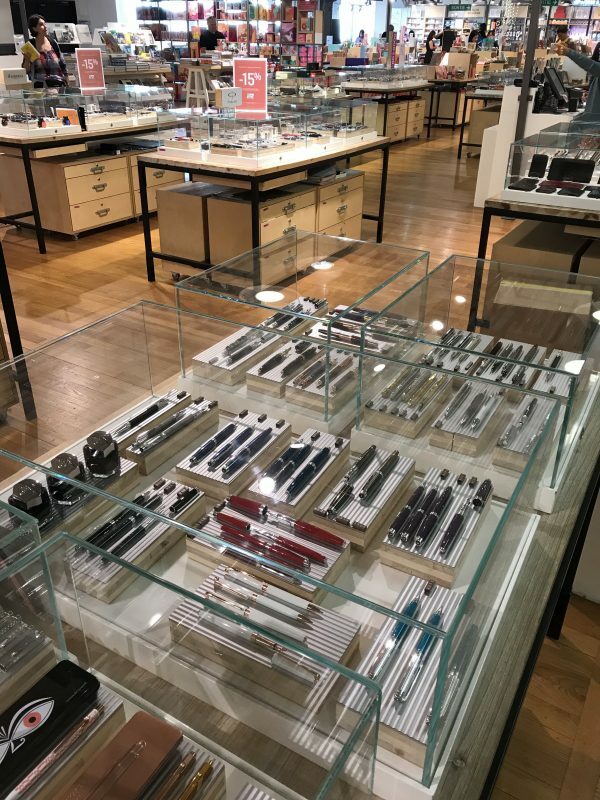 There are also many boutiques for luxury brands that sell fountain pens, such as Montblanc and S.T. Dupont, scattered throughout the city. 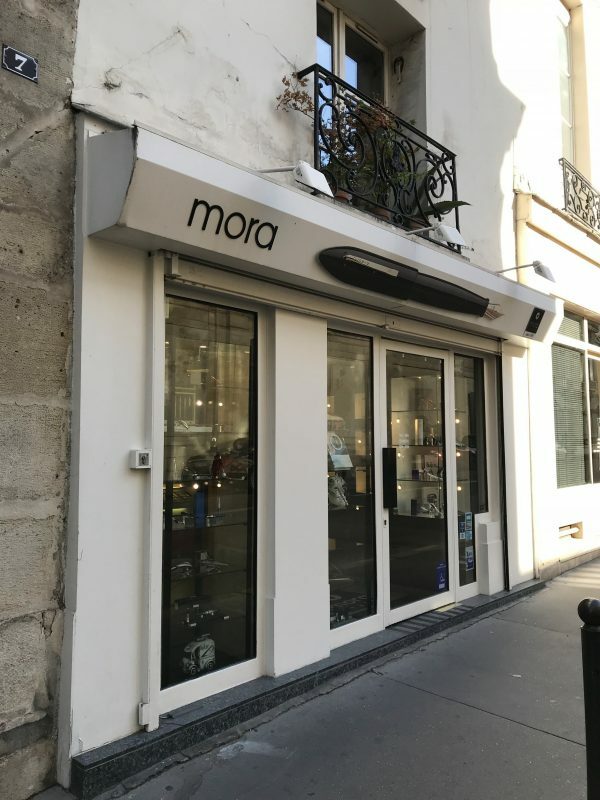 Mora Stylos, located south of the Louvre, was easily my favorite fountain pen shop in Paris. They have the widest selection of pen brands, including Pelikan and a few Japanese manufacturers like Sailor and Pilot. They also have a great selection of used modern pens and vintage pens. This was the only shop that I visited that sold any type of used pens. They also have a decent selection of inks. The one thing I didn’t see were any paper products, although they might have had them in the back along with their inks. This was also the friendliest pen shop that I visited. The woman who helped me was more than happy to chat about the displays around the shop (vintage Waterman products), suggest other shops for me to visit and let me test pens. She knew their inventory very well, so when I said that I liked broad nibs she was able to pull out the used pens that I might like. Palais du Stylo is in the heart of Paris near the Opera House. It carries all of the typical pen brands you can find in shops across Paris, as well as some Pelikan and Sailor pens. It also carries Jean Pierre Lépine, an unusual French pen brand. They have a nice selection of inks, but again, I didn’t see any paper products. The people who worked here didn’t seem very interested in helping me out. It’s a very small shop and I was in there for at least 5 minutes without them saying anything to me. Once I finally asked about a pen, they were happy to help. Opera Stylos is another shop located near the Opera House. It seemed to carry a very basic selection of pens that were widely available at other pen shops and department stores. I felt like it didn’t take me very long to see everything that they had to offer. 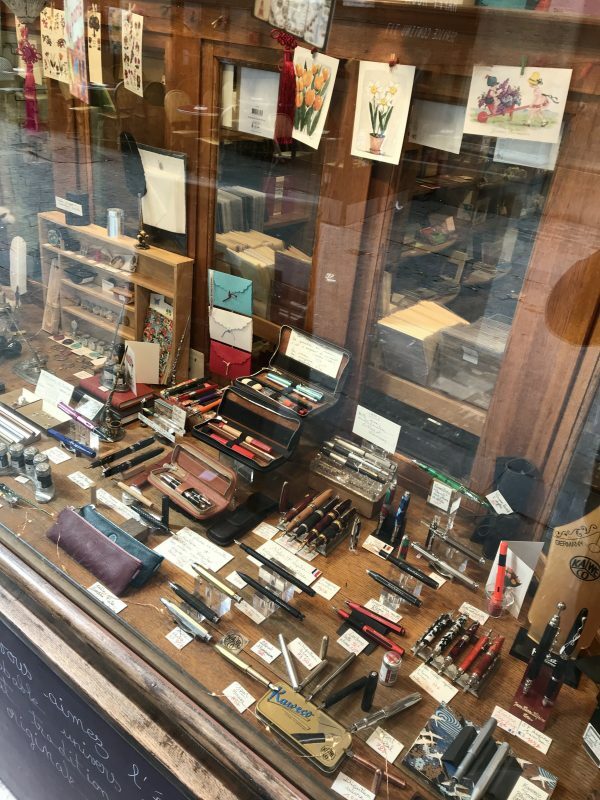 L’Ecritoire is a wonderful shop that carries a small variety of pens, inks and papers just north of Notre Dame near the fun Le Marais neighborhood. They don’t have a huge selection of fountain pens, but do have quite a few Kawecos and Lamys. They also have many dip pens and inkwells if that is something you enjoy. They have a nice selection of paper products as well as a good ink selection. The woman who ran the shop was very friendly and helpful. I mentioned that I learned about her shop through Instagram and she said that she gets lots of her business that way, so if you happen to visit and like the shop, consider sharing it on social media to help others discover it as well. Le BHV Marais is a fun, modern department store just north of Notre Dame. 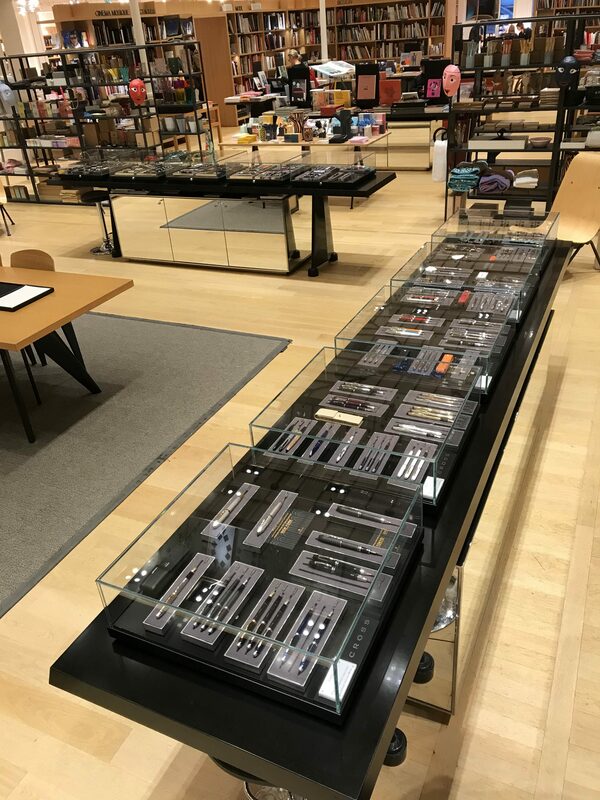 On the 2nd floor you’ll find an amazing selection of fountain pens. Case after case is filled with pens and inks of the same brand. One pen brand that they carry that I didn’t see in other shops is Sheaffer. If you like paper, you’ll love the paper selection at BHV. It has a huge selection of journals, notebooks, planners and fine stationery. It also has a general selection of office supplies, which means plenty of Clairefontaine and Rhodia products. You can also find many brands of ink cartridges with the office supplies. Galleries Lafayette is a must-see shop near the Opera House in Paris. The interior is incredible and the view of the city from the top floor can’t be beat. Just one floor down from that amazing view are many cases of fountain pens. There isn’t anything here that you won’t find anywhere else, but the building and the view definitely make it worth a visit. If you were to choose only one pen shop to visit in Paris, based on my experience I would highly recommend Mora Stylos. Not only do they have one of the best pen selections, but they were also the most helpful. The fact that they carry vintage fountain pens along with a good selection of used pens makes them a great choice for anyone who is interested in fountain pens. If you were to choose only one department store to visit in Paris, it would be a toss up between Le BHV Marais and Le Bon Marché. If paper is your thing, BHV is the way to go. If you’re more interested in ink or Japanese pens, Bon Marché is your best bet. You can’t go wrong with either choice, but if you have time I’d suggest you visit both as they each have something unique to offer. If you like good paper, the selection at BHV will make you very happy. Be sure to take advantage of the great prices on Clairefontaine Triomphe and G. Lalo papers. I saw papers from G. Lalo there that I hadn’t seen anywhere else, including Vélin pur Cotton and Toile Impériale. 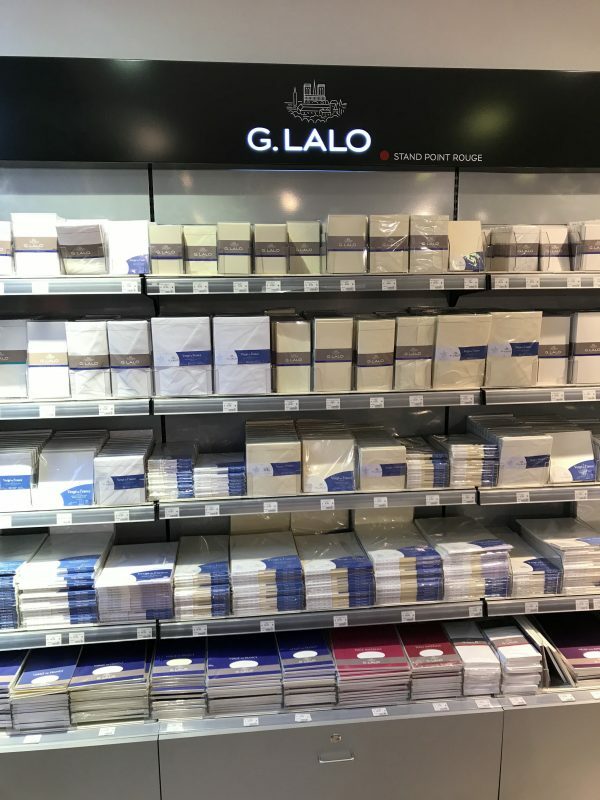 While BHV has the best paper selection, Bon Marché has some wonderful notebooks that are worth considering if you want some super-smooth French paper that is similar to Japanese paper. Specifically, Carnet Chouette (or Owl Notebook) has some beautiful notebooks with wonderful paper that are screen printed and hand-numbered . While it doesn’t sheen like Tomoe River, it does show sheen and is the closest thing to Japanese paper that I found in Paris. If you’re interested in picking up some ink that is harder to find, head to Bon Marché. They carry the entire line of Jacques Herbin Les Essentielles inks. Happy travels and have fun exploring Paris! 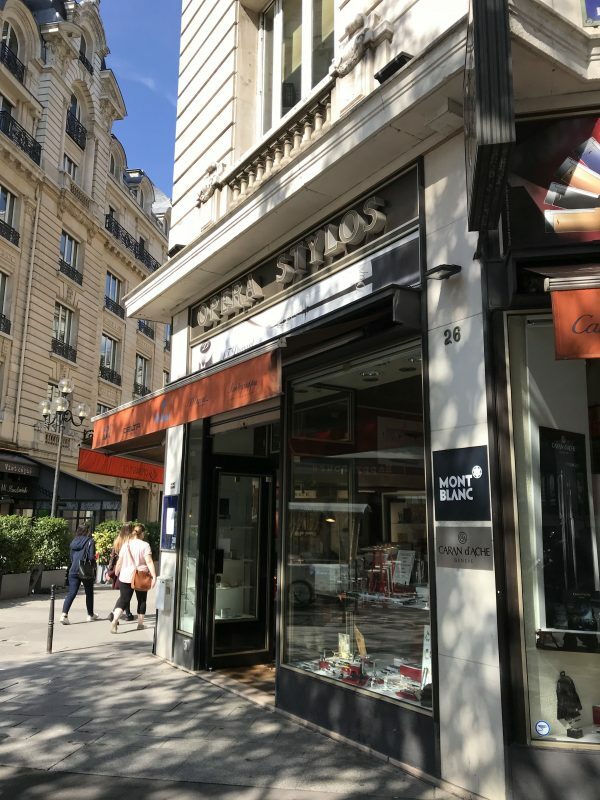 I’ve been to Le Marais a few times (actually stayed there) and have visited Le bon Marché but never thought to pen shop. It was before me being reacquainted with pens. Maybe next time. Thomas, definitely stop in for a visit next time. It’s worth it! John, I’m intrigued no shop that you mentioned sold Chinese pens. Jinhao do some lovely pens, as do Wing Sung. It’s good to have a holiday. I’m thinking that I should have one. Please use the word Stationery. A stationary shop is one without wheels. Noel, I was a little surprised at the lack of Japanese pens, but never expected to find Chinese pens. While they might be nice, I can’t say that I’ve ever seen them in any retail shops, only online. While some shop that I didn’t visit might sell them, the brands available in Paris seemed to be limited.